As a lifelong movie geek, I am wildly excited for "Mad Max: Fury Road." At the same time, I always found an odd choice, an interesting choice but odd. I always wondered how many people in my age group remember the other Mad Max movies which starred Mel Gibson. I have the first Mad Max and I plan to get "The Road Warrior" as soon as the opportunity presents itself. Both of those films came out deep into the 1980's and I always wondered if Hollywood could make this franchise relevant again. After viewing the final trailer for "Mad Max: Fury Road" tonight, I have all the faith in the world that this franchise can work again. Especially since the brainchild himself, Mr. George Miller has returned to this crazy, dangerous world. I think if there is one actor who can channel what Gibson did with the role so many years ago, yet still make something his own, its Tom Hardy. I have watched his rise since 2002, when he had a small stint on HBO's "Band of Brothers" and I saw something special in him. Little did I know he'd make a bigger splash that most of the main cast of that mini-series, funny how things work out sometimes, eh? I can't wait to see more of Hardy as Max this May. 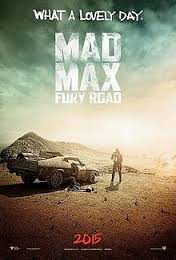 The "Mad Max" films made the dystopian landscape in movies cool way before "The Hunger Games" did, and I love that Miller is playing that up, I love the outlook of this entire trailer and I can't wait to plunge into this world in a couple months. I think the action in the trailer is very well done, and I love that we have only faint whispers in terms of storyline, not a whole lot has been revealed yet. I like it, especially since most trailers seem to give an entire movie away in just under two minutes. If you haven't been introduced to the world of Mad Max yet, I think a great gateway will be presented to you in a couple months. Be ready.